Aerial view of the three lava ocean entries. At a base near Honolulu, a pair of CH-53E Super Stallion helicopters have been readied in case encroaching lava flows reach State Highway 130. If blocked, residents living in Leilani Estates and the surrounding neighborhoods would be cut off from grocery stores, schools, and hospitals. 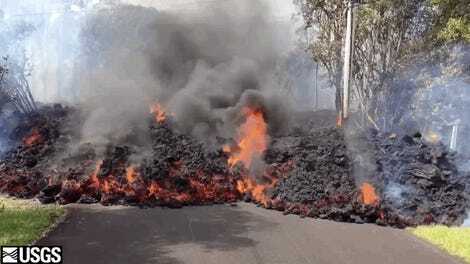 Around 2,000 people have already been evacuated from this coastal community, and another 2,000 would have to flee should the lava reach the highway or if large cracks open up in the road. The US Marine Corps says its two helicopters can carry up to 50 passengers at a time. Road crews have been dumping material into cracks on the highway and covering them with steel plates to keep the road accessible. Aerial view of the lower East Rift Zone showing the lava channel merging from Fissure 22 (not visible, but to the center, far right of the image). 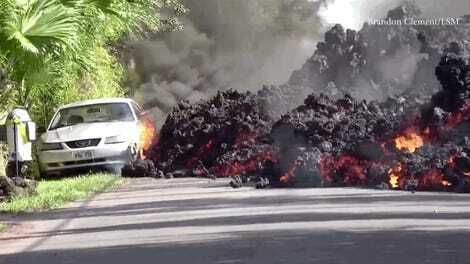 Meanwhile, a third lava flow has reached the ocean just east of Mackenzie State Park, the USGS has confirmed. The lava pouring into the sea is creating large plumes of laze—clouds of gas and tiny shards of glass—that pose a risk to nearby residents. Indeed, air quality is a growing concern, as those living near the lava bursts are being exposed to high levels of sulfur dioxide. Residents may have to flee should the air quality deteriorate further. 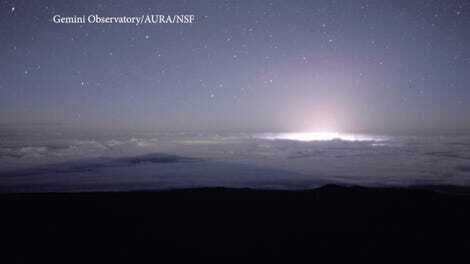 In addition, explosive eruptions at Kilauea’s summit crater have released clouds of ash, which are drifting onto communities downwind. Illustration of Kilauea volcano from the summit caldera to the lower East Rift Zone. Officials are also warning about worsening ground cracking, which has already badly damaged one home. The cracks have torn roads apart in some places, and created gaps as wide as three to 10 feet. Geologists with the USGS say this is a sign that magma is continuing to enter the rift zone and that additional eruptive activity is likely. 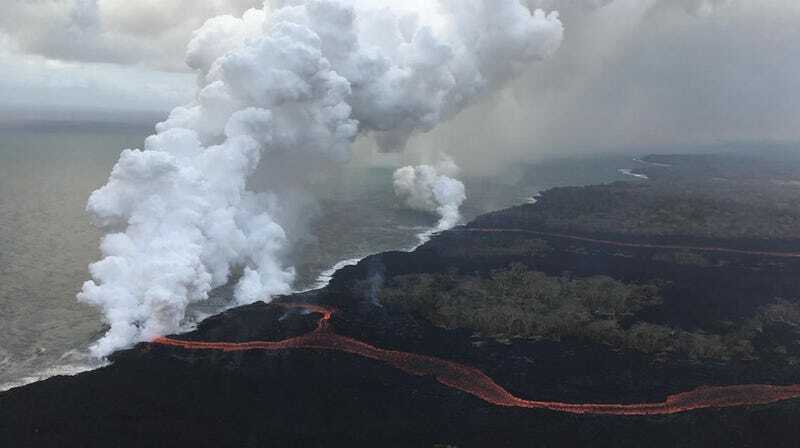 Since the Kilauea eruptions began on May 3, more than 20 vents have appeared in the Puna region, and they’re collectively pouring out lava at the astonishing rate of 40 to 60 cubic feet each second. 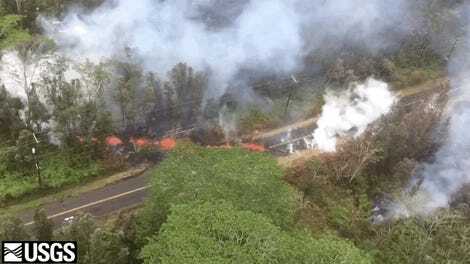 The fissures extend for two miles, and lava has now covered more than 1,700 acres in lower Puna, though the actual figure is probably higher. To date, over 50 structures have been wrecked, around half of which are homes. The Big Island is now bracing for a second phase of evacuations, with no end to the eruptions in sight.